Orthodox Church liturgical Greek Priest clergy vestments (white-silver) by Istok Church Supplies Corp.
Our exclusive collection of Greek Priest vestments in white and silver are a subtle yet effective way of conveying the high standing of an Orthodox Christian Greek Priest. We understand the importance of traditions in Orthodox Christian faith and ensure that these liturgical vestments are custom tailored by master tailors with highest regard for quality workmanship and age old canons. Istok Church Supplies offers a broad range of white and silver Greek Priest vestments made from majestic fabrics such as rayon jacquard and metallic jacquard. In addition to this, we also offer elegant embroidered vestments featuring highest quality German Madeira and Gunold threads. Customers who would like their order in a specific fabric belonging to same price range as the one featured can select from our fabrics section and make a request through the Notes section while ordering. Our Greek Priest vestments are offered as complete sets and include five items – phelonion, zone, epimanika, epigonation and palitsa. The set does not contain the podriznik which, along with matching chalice covers, can be added to orders for an additional cost. 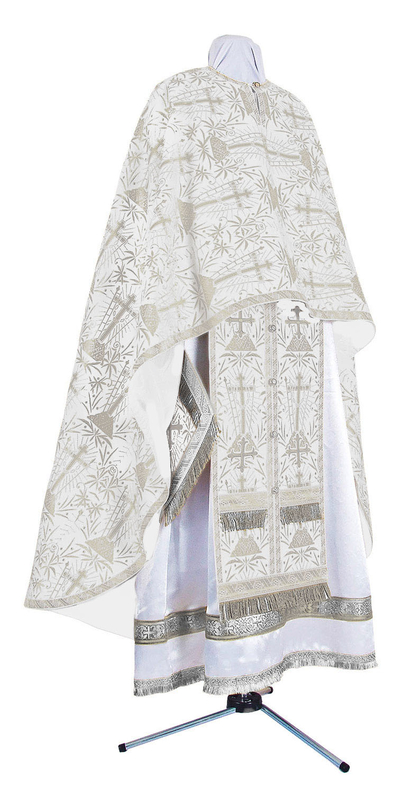 All our Greek Priest vestments feature pure natural rayon lining to minimize discomfort. We also provide top quality natural velvet inserts at an additional cost. Customers can upgrade orders by opting for an embroidered icon from given list of choices. We offer three decoration types for our Greek Priest vestments white and silver – the economic standard type, mid-range premier type and high end luxury type - so customers can purchase according to needs and budgets. The vestments sets weigh around three and a half kilos and are designed to provide many years of use. Istok Church Supplies specializes in custom liturgical vestments and customers can send their individual measurements and receive perfectly fitting garments that hang well on the wearer. With our extensive collection, user friendly browsing experience, convenient online purchasing options and door delivery services, you don’t need to look anywhere else for custom Greek Priest vestments. Happy shopping!